New York: Crown Publishers, 2010. Signed limited edition of George W. Bush's autobiography. Octavo, original cloth, original slipcase, illustrated. Signed by George W. Bush and additionally signed by Senator John McCain, who was the Republican nominee for President in 2008. Fine in a fine slipcase. George W. Bush served as president of the United States during eight of the most consequential years in American history. The decisions that reached his desk impacted people around the world and defined the times in which we live. Decision Points brings readers inside the Texas governors mansion on the night of the 2000 election, aboard Air Force One during the harrowing hours after the attacks of September 11, 2001, into the Situation Room moments before the start of the war in Iraq, and behind the scenes at the White House for many other historic presidential decisions. New York: Crown Publishers. Fine in Fine dust jacket. 2010. First Edition; First Printing; Signed by Author. 1/4 Cloth. 9780307590619 . An attractive first edition/first printing in unread Fine condition in alike dust-jacket, SIGNED by US President George W. Bush directly on the title page; George W. Bush's honest autobiography about key moments, flaws and victories in US history. The contested 2000 election; the 9/11 attacks, the wars in Iraq and Afghanistan, historic and controversial decisions on the financial crisis in the early 21st century. He also offers insights about his personal life and relationship with his family . Crown, 2010-11-30. Ltd Sgd. Hardcover. Used:Good. New York: Crown Publishers, 2010. Signed limited edition of George W. Bush's autobiography. Octavo, original cloth, original slipcase, illustrated. Signed by George W. Bush. Fine in a fine slipcase. George W. Bush served as president of the United States during eight of the most consequential years in American history. The decisions that reached his desk impacted people around the world and defined the times in which we live. Decision Points brings readers inside the Texas governors mansion on the night of the 2000 election, aboard Air Force One during the harrowing hours after the attacks of September 11, 2001, into the Situation Room moments before the start of the war in Iraq, and behind the scenes at the White House for many other historic presidential decisions. New York: Crown Publishers, 2010. Silver lettered black cloth with ribbon marker in matching slipcase. Edition limited to and unknown number of copies (5000?) that are signed and numbered by the author. This is #92. Some dust soilin and wear to box but o/w a fine copy of the memoirs of the 43rd President.. Limited Edition. Cloth. Fine. 8vo. New York: Crown Publishing Group / Random House, 2010 First Printing of stated First Edition: Deluxe Limited Edition, Signed by George W. Bush directly on the Limitation page. Book and slipcase in fine, as new condition; no dust jacket, as issued. New York: Crown Publishing Group. As New. 2010. Limited Edition; Signed by Author. Cloth. 9780307885227 . 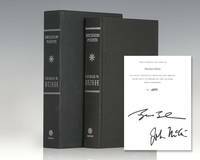 A stunning limited, slipcased edition in As New condition in alike slipcase, signed by author and George W. Bush, 43rd President of the United States. A truly presidential collectible ; George W. Bush's honest autobiography about key moments, flaws and victories in US history. The contested 2000 election; the 9/11 attacks, the wars in Iraq and Afghanistan, historic and controversial decisions on the financial crisis in the early 21st century. He also offers insights about his personal life and relationship with his family . New York: Crown Publishers, 2010. First Edition. Hardcover. Fine. Limited edition, numbered and signed by George W. Bush. Also includes a special color photo frontispiece not found in the trade edition. In this extraordinary memoir, America's 43rd President writes candidly about the hotly contested 2000 election, 9/11, the war in Iraq, Hurricane Katrina, Afghanistan, and the other events that shaped the first decade of the 21st century. Octavo. Original black cloth binding, with silver titles and a ribbon marker. A fine copy, housed in the publisher's slipcase - as new, still sealed in the original shrinkwrap. New York: Crown Publishers, 2010. First edition. Hardcover. SIGNED. 497pp. Octavo [24 cm] Black paper covered boards with a gilt stamped title on the spine. Very good. Moderately bumped and rubbed at the spine ends. There is an inscription on a gift card that has been mounted to the front free endsheet. With the pictorial dust jacket, in very good condition, with marginal soiling to the surface. A first edition, signed by George Bush on the title page. In this memoir, George W. Bush reveals his perspectives and insights on a variety of subjects for the first time, such as his decision to quit drinking, the selection of his key officials, his administrations counterterrorism plan, and much more. New York: Crown Publ, (2010). First edition. Special "Decision Points" BOOKPLATE SIGNED BY BUSH laid in along with a pre-printed card from the "Office of George W. Bush," thanking the recipient for his/her support, etc. Fine in fine dust jacket. Crown. Hardcover. 0307885224 Like New Condition. . Fine. Crown. Hardcover. 0307885224 New Condition. . New. New York: Crown Publishers, 2010 First edition signed by the author and ex-president on special "Decision Points" bookplate attached to half-title page "George Bush" with black marker. Not inscribed. Full number line on copyright page 10 9 8 7 6 5 4 3 2 1. 8vo. Black boards stamped in gilt on spine. xii, 497 pages. 14 chapters. Two sections of photographs in B&W and color printed on slick paper. Not a remainder. Clean. Sharp. Like new dust jacket in clear jacket protector sleeve. Like new/ Like new..
New York: Crown Pub, 2010. Book. N-Fine. Hardcover. Signed by Author(s). First Edition/First Printing. Decision Points, A square solid tight carefully read copy. This copy has some light soil to the edges of the text block. The priced jacket has some light rubbing wear, some light edges wear. THIS COPY IS IN MY POSSESSION AND WILL NORMALLY SHIP NEXT DAY. The previous owner removed a book plate from the ffep leaving a scar and residue.I cleaned up the residue and I have LAID in a book plate that will cover that scar if you want to use it. .
New York: Crown Publishers, 2010 Eleventh printing signed by the author and ex-president on special "Decision Points" bookplate attached to half-title page "George Bush" with black marker. 8vo. Black boards stamped in gilt on spine. xii, 497 pages. 14 chapters. Two sections of photographs in B&W and color printed on slick paper. Not a remainder. Clean. Sharp. Like new dust jacket. MINT. Like new/ Like new..
New York: Crown Pub, 2010. Book. N-Fine. Hardcover. Signed by Author(s). First Edition/First Printing. Decision Points, A square solid tight carefully read copy. This book was released on November 9, 2010. It was signed on his first stop of a three city tour, a Borders Bookstore, now closed, that was located in the Dallas, Texas neighborhood where he and the First Lady now live. The former President arrived at the store at 8:30 AM and left between 11 and noon. He sat in the store and signed each book, exchanged pleasantries and shook hands with all who purchased the book. The book store sold out of 2500 copies. When the books ran out he also signed a unknown number of specially designed Decision Points Bookplates for those customers who wanted to order a copy to arrive at a later date. This is one of those copies and the signed bookplate is tipped into the book. At the actual signing event the Secret Service would not allow cameras inside the building but I will include pictures of the crowd that formed outside the store that I took. THIS COPY IS IN MY POSSESSION AND WILL NORMALLY SHIP NEXT DAY. .
New York: Crown Publishers, 2010. AG3 - A first edition (stated with complete numberline) hardcover book SIGNED by author on 'Decision Points' bookplate adhered on front free endpaper in very good condition in very good dust jacket that is mylar protected. Dust jacket and book have some bumped corners, light discoloration and shelf wear. In this candid and gripping account, President George W. Bush describes the critical decisions that shaped his presidency and personal life. 9.5"x6.5", 497 pages. Satisfaction Guaranteed.. Signed by Author. First Edition. Hard Cover. Very Good/Very Good. 8vo - over 7¾" - 9¾" tall. NY: Crown Publishers. Very Good+ in Very Good+ dust jacket. 2010. First Printing. Hardcover. 0307590615 . In VG+ DJ; Signed by author on publisher's bookplate. 1st printing of 1st edition. Hardback (black spine/black boards). B&W & color photos. Autobiography of former president; 8vo 8" - 9" tall; 497 pages; Signed by Author . NY: Crown Publishers. Very Good+ in Very Good+ dust jacket. 2010. First Printing. Hardcover. 0307590615 . In VG+ DJ; Signed by author on half-title page. Hardback (black spine/black boards). B&W & color photos. Autobiography of former president; 8vo 8" - 9" tall; 497 pages; Signed by Author . Crown Publishers, 2010. Hardcover. As New/As New. Signed on book plate. 2011-08-01. Good. Ships with Tracking Number! INTERNATIONAL WORLDWIDE Shipping available. May not contain Access Codes or Supplements. May be ex-library. Shipping & Handling by region. Buy with confidence, excellent customer service! 2011-07-01. New. Ships with Tracking Number! INTERNATIONAL WORLDWIDE Shipping available. Buy with confidence, excellent customer service! Crown Publishers, 2010-11-09. Hardcover. Near Fine/Near Fine. Signed. Seventh printing. Flat SIGNED by former President George W.on the title page. The volume is bumped on the spine ends. The unclipped dust jacket, protected in a Brodart sleeve, has just trace wear. New York: Crown, 2010. First / First. Fine with/fine. SIGNED, "George Bush" on publisher's bookplate affixed to fep. 6" x 9.25" pp. xii, 2-497 with 32 pages of color photographs. Book and DJ both in fine condition, minus 1" rub on fep and an unrelated autograph gift inscription on the dedication page. George W. Bush, 43rd President of the United States (2001 - 2009) recounts his time in the oval office which will always be correlated to the War in Iraq. He uses this post presidential memoir to imprint on history his version of events which unfolded from decisions he made or to which he responded. "As I record these thoughts more than seven years after American troops liberated Iraq, I strongly believe that removing Saddam from power was the right decision. For all the difficulties that followed, America is safer without a homicidal dictator pursuing WMD and supporting terror at the heart of the Middle East". (p. 267). 2010-04-04. New. Ships with Tracking Number! INTERNATIONAL WORLDWIDE Shipping available. Buy with confidence, excellent customer service! Crown Publishers, 2010-11-09. Hardcover. Very Good. Signed by Author. Flat signed by President Bush on the title page. 9th printing. Dust Jacket has light shelf wear. Corners and edges lightly rubbed. Clean text. A percentage of the proceeds of this sale benefits a nonprofit organization. Please feel free to inquire for more details. We are more than happy to answer questions and provide photos upon request. Crown Publishers. Fine in Fine dust jacket. 2010. AUTOGRAPHED; First Printing. Hardcover. 0307590615 . Like new hardback in a like new dust jacket. The president signed (signature only) on a special bound in page after the front endpaper. Signature was not on a bookplate. Dust jacket is not price clipped. As new book and jacket. 1st edition with full number line. ; 9.80 X 6.57 X 1.61 inches; 497 pages; Signed by Author . Crown Publishers, New York, NY, 2010. Hardcover. Near Fine Condition/Near Fine. Inscribed by the President "To Bob" on title page. Size: 8mo - over 7 3/4" - 9 3/4" tall. 497 pp. Pages are tight and clean. Dust Jacket price-clipped. Previous owner's name ink-stamped. Cover has no significant flaws. Quantity Available: 1. Shipped Weight: 2 - 3 pounds. Category: Biography & Autobiography; ISBN/EAN: 9780307590619. Pictures of this item not already displayed here available upon request. Inventory No: 001663. . 9780307590619 Additional shipping charges may apply. U.S.A.: Crown, 2010. 1st Edition . Hardcover. Fine/Near Fine. Signed by author on book plate on free front end paper. Minor edging and self wear. GREAT BOOK! Not inscribed. Has two dust jackets for some reason. Will include both. NY: Crown Publishers. Very Good+ in Very Good+ dust jacket. 2010. Ninth Printing. Hardcover. 0307590615 . In VG+ DJ; Signed by author on publisher's bookplate. Hardback (black spine/black boards). B&W & color photos. Autobiography of former president; 8vo 8" - 9" tall; 497 pages; Signed by Author . Nice First Edition hardcover, pages are clean, crisp, binding tight. Cover boards fine in fine dust jacket. An excellent copy. --In this candid and gripping account, President George W. Bush describes the critical decisions that shaped his presidency and personal life. New York: Crown Publishing, 2010. Book. Fine. Hardcover. Signed by Author(s). 1st Edition. Signed by George Bush in black marker on the half title page..
Crown, 2010. Hardcover. New. 9.5 x 6.5 cm. New York: Crown Pub, 2010. Book. Fine. Hardcover. Signed by Author(s). First Edition/ Third Printing. Decision Points, A square solid tight carefully read copy if at all. This copy has the previous owner's name neatly on the reverse of the front board. THIS COPY IS IN MY POSSESSION AND WILL NORMALLY SHIP NEXT DAY. This copy has been inscribed by the President To Larry Best Wishes George W. Bush on a special Decision Points book plate which has been tipped to the reverse of the front board. This copy has a gift inscription neatly on the ffep..
New York: Crown Publishers. 2010. First Edition; First Printing. Hardcover. 0307590615 . Near Fine in a Near Fine dust jacket. Clean and bright pages. ; 9.30 X 6.60 X 1.70 inches; 497 pages; Original unclipped dust jacket protected by archival Brodart cover. All domestic orders shipped protected in a Box. .
Crown Pub. First Edition, First Printing, 2010. Crown Pub. First Edition, First Printing, 11/09/2010. Black paper over boards, black cloth spine, gold lettering. Near Fine, vibrant, tight, no writing or labels./DJ, Near Fine, clean, vibrant, not clipped. Great Gift.. President George W. Bush describes the critical decisions of his presidency and personal life. Decision Points is the extraordinary memoir of America's 43rd president. Shattering the conventions of political autobiography, George W. Bush offers a strikingly candid journey through the defining decisions of his life. In gripping, never-before-heard detail, President Bush brings readers inside the Texas Governor's Mansion on the night of the hotly contested 2000 election; aboard Air Force One on 9/11, in the hours after America's most devastating attack since Pearl Harbor; at the head of the table. Crown Pub. First Edition, First Printing, 11/09/2010. Full #'s line 1-10, Near Fine, vibrant, tight, no writing or labels. Black paper over boards, black cloth spine, gold lettering. DJ, Near Fine, clean, vibrant, not clipped. Great Gift. Many Colored Photos. Condition: Near Fine, vibrant, tight, no writing or labels. New York: Crown Publishers. 2010. First Edition; First Printing. Hardcover. Very Good+ in a Very Good+ dust jacket. ; 8vo 8" - 9" tall; Original unclipped dust jacket protected by archival Brodart cover. All domestic orders shipped protected in a Box. .
Random House Large Print. PAPERBACK. 0739377825 New Condition. . New. Crown Publishers. Hardcover. 0307590615 New Condition. . New.